Sapphire and diamond floral ring set in 14k white gold with six genuine sapphire gemstones weighing a total of 0.38 carats. White, quality diamonds weigh a total of 0.09 carats in H-I Color, I1 Clarity. Shop our collection of quality sapphire rings. 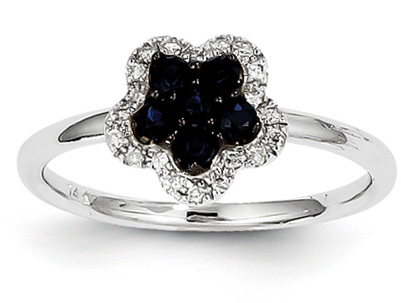 We guarantee our Sapphire and Diamond Floral Ring, 14K White Gold to be high quality, authentic jewelry, as described above.